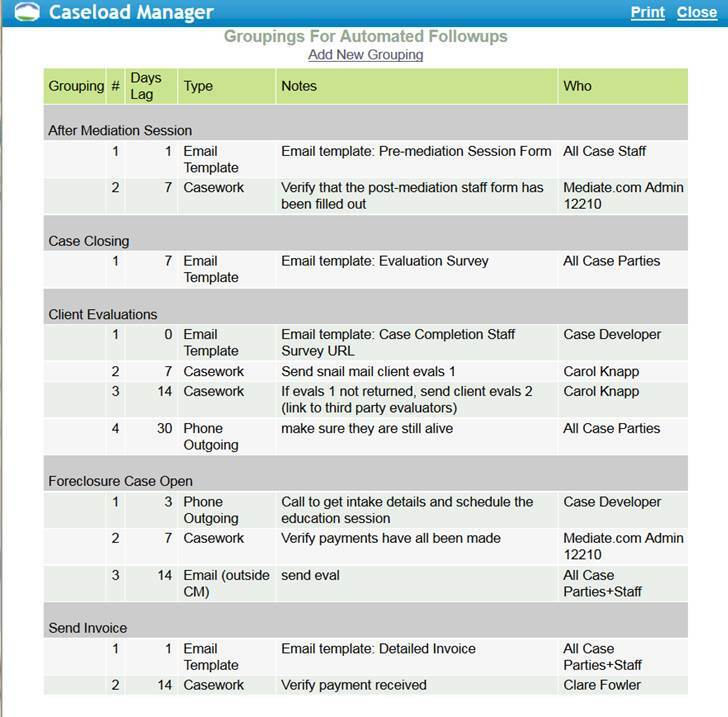 Automated Followups are a group of calendar items and/or emails that will be triggered in sequence as a follow up to an activity or calendar item entry. Once groupings are pre-defined and named, they can be associated with any activity or calendar item. These Followups can be specific Calendar items that are placed on people's calendar, reminding them to do something at a certain date in the future. Followups can also be used to send out pre-defined emails to staff and/or participants. For example, after a mediation session occurs, you may want to automatically email the participants to give them a link to take an evaluation survey; you may also want a staff person to follow up a week later to make sure they completed the survey, then two months later you might want to trigger another email. All these can happen as a result of the calendar entry for the mediation session. 1) If you would like to use automated email followups for your office, begin by creating the email templates in Mail Manager. a. Under Settings>Automated Followups, select “Add New Grouping”. b. Enter a Grouping name and save. c. Under Settings>Automated Followups, click on the group you just created. d. Select either “Add followup calendar item” or “add followup email” for each item you want to add to the grouping. You will set what the lag time should be before triggering the followup, who will be invololved, and calendar-specific or email template details. 3) To trigger the followup, add a new calendar item or activity. At the bottom of the Add Calendar Item window, you will see your followup. Check the followups that you would would like to trigger. You may also use this feature to send out automated survey invitations to both participants and staff.